an initiated a revolution in Malayalam poetry in the first quarter of the 20th century, transforming it from the metaphysical to the lyrical. Deep moral and spiritual commitment is evident in Asan's poetry. His works are an eloquent testimony of poetic concentration and dramatic contextualization. Asan was born in a merchant family belonging to the Ezhava community in April 1873 in Kayikkara village, Chirayinkeezhu taluk, north of Thiruvananthapuram district of Kerala, south India. Named Kumaru He was the second son in a family of nine children. His father, Narayanan Perungudi, was well versed in Malayalam and Tamil. Asan inherited his taste for Kathakali and classical music. Kumaru trained in mathematics and Sanskrit for which he had a passion. Even though through his father's efforts, he got a job as a primary school teacher and an accountant to a wholesaler at the age of 14, he quit the job two years later to pursue higher studies in Sanskrit. He undertook a studentship in poetry under Manamboor Govindan Asan. He wished to learn Yoga and Tantra and worked as an apprentice in a Muruga temple at Vakkom. It is said that the Muse of Poetry blessed him during this time. He composed a few devotional songs for the benefit of regular worshippers at this temple. In 1917 Asan married Bhanumathi Amma of Tharkauduyil family to which belonged Rao Bahadur Belayudhan and Dr.P.Palpu, prominent members of the community. Kumaran Asan had two sons.Kumaran was dogged by ill-health all through his early life. When he was eighteen, Sree Narayana Guru visited his house at the request of his father. Kumaran was bedridden at that time. The great saint suggested that Kumaran should stay with him and become his disciple. The little boy found the invitation irresistible. Thus began a new phase of life for the young lad. Kumaran�s meeting with Sree Narayana Guru can be compared to the meeting of Naren with Sri Ramakrishna. 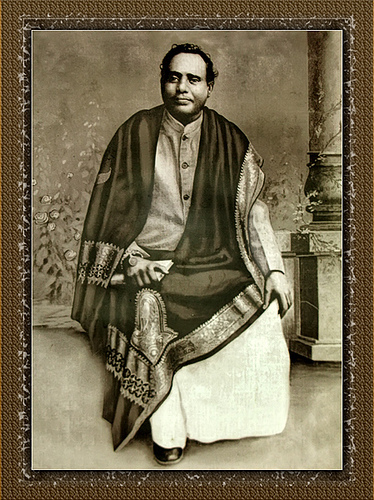 While Naren became a full fledged Swami, Kumaran continued as a lay disciple of Narayana Guru and made substantial contributions in the fields of poetry, literature and social renaissance. Swamy took the fledgling devotee under his care and in 1895 Kumaran was sent to Bangalore for 3 years for higher studies in Sanskrit, at the Sree Chamarajendra Sanskrit College. He specialized in Tarka sastra. He could not take the final exam. Leaving Bangalore he came to Madras and after a brief stay, left for Calcutta to join the Sanskrit College. His teacher was Mahamahopadhyaya Kamakhya Nath who encouraged the poetic gift of his student and prophesised that he would one day become a famous poet.